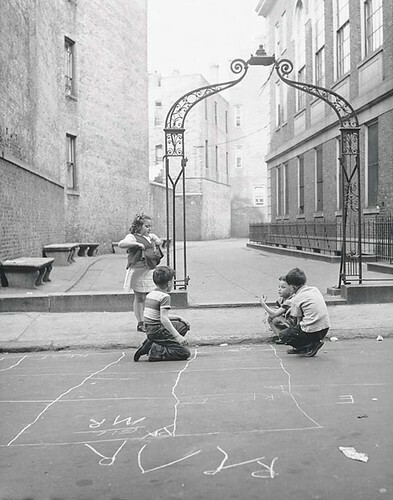 Children play in the North End in the 1950s. Photograph by photographer Jules Aarons. By day a physicist and professor at Boston University, he began taking photographs in the streets of Boston in the 1940s. A just-opened retrospective on Aarons’ work at the Boston Public Library runs through June 4. This entry was posted in Boston, Events, Images and tagged Boston, Boston Public Library, Boston University, Exhibit, Jules Aarons, North End, Photographs. Bookmark the permalink.